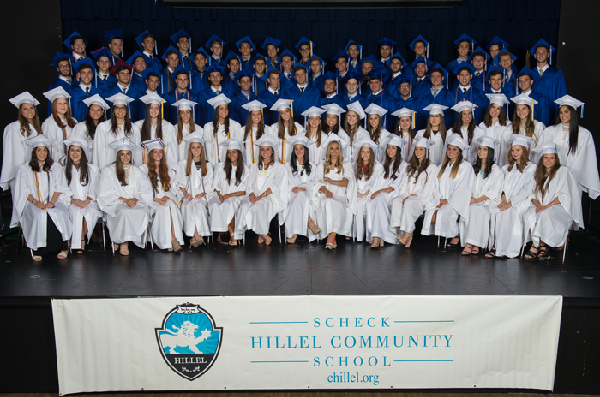 Nearly 1,400 community friends gathered to celebrate Scheck Hillel Community School’s Class of 2017 commencement on May 16 in the school’s Diener Athletic Center. These graduates were accepted to amazing universities, yeshivot and gap year programs across the globe, including Cornell, Emory, Georgia Tech, University of Florida, IDC Herzliya, University of Michigan, New York University, Tufts and more. The community also heard from students during this special event. “We are about to enter a whole new world with a diverse array of people, housing a diverse array of thought,” Jordana Zackon said in her Valedictorian remarks. “This gives us the opportunity to learn and to grow, to make us question our preconceived notions, and even to strengthen our beliefs.” In the fall, Jordana will attend Washington University in St. Louis, Sam Fox School of Design and Visual Arts. Salutatorian Danielle Scheck also spoke at Commencement. “…We had quite the experience here at Scheck Hillel, which has transformed us into who we are today: inquisitive and ambitious leaders. Most importantly, we are determined to make a difference in the world with tikkun olam and carrying on the traditions that our parents and school have instilled in us.” Danielle will attend the University of Michigan, Ross School of Business, in the fall. David Oliel charged his fellow graduates with a powerful message in his remarks as Student Government President. “In college, in career and in life, our Jewish identity will always be a part of us, and we should never forget it. We need to protect who we are, what we stand for...what it means to be Jewish.” David will attend Concordia University in Montreal, Canada. Commencement festivities began May 11 at the Senior Awards Ceremony, where proud family members and friends looked on as students received awards and honor society tassels. May 15's Senior Dinner provided an opportunity for families to celebrate the graduates together. The graduates received a personalized Yeverechicha blessing from Dr. Levy and took in remarks from Associate Head of School Vanessa Donaher and Yossi Yativ, a Scheck Hillel Hebrew and Israel Education teacher who has been inspiring Scheck Hillel students for more than 30 years. Once the graduates received their diplomas, the newest generation of alumni proudly moved their tassels and tossed their graduation caps in the air. Scheck Hillel is proud to give a mazal tov to the Class of 2017 and their families. We can’t wait for them to come back to visit us at home. 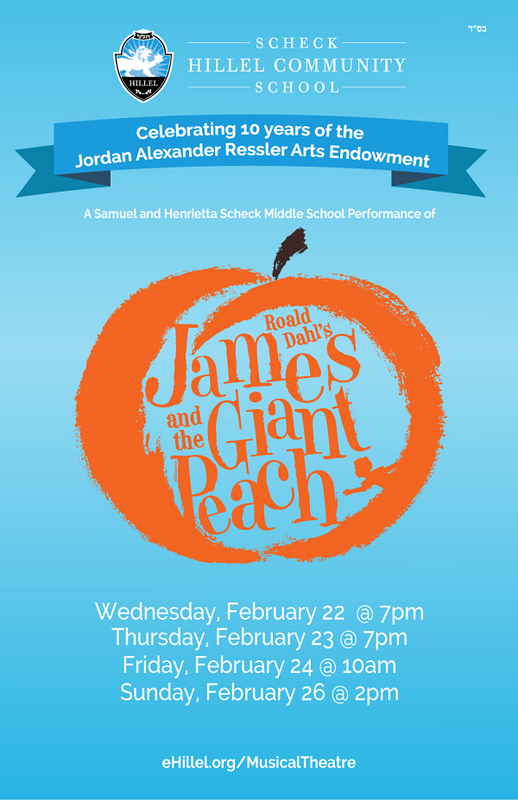 Scheck Hillel Community School’s Jordan Alexander Ressler Arts Program brings to life Roald Dahl's "James and the Giant Peach" for the whole family to enjoy! The student cast and crew takes audiences on the magical journey of a boy and his insect friends across the ocean on a giant piece of fruit. Purchase your family’s tickets at eHillel.org/boxoffice($10/ticket). When James is sent by his conniving aunts to chop down their old fruit tree, he discovers a magic potion that results in a tremendous peach...and launches a journey of enormous proportions. Suddenly, James finds himself in the center of the gigantic peach – among human-sized insects with equally oversized personalities – but, after it falls from the tree and rolls into the ocean, the group faces hunger, sharks and plenty of disagreements. Thanks to James' quick wit and creative thinking, the residents learn to live and work together as a family. The dangerous voyage is a success, but the adventure takes a whole new twist once they land on the Empire State Building. Directed by Anthony Campisi with musical direction by award-winning Emmanuel Schvartzman and choreography by Justine Rosales. Anthony Campisi has an impressive trajectory in musicals, as music director/director of more than 100 musicals in South Florida. He has worked with Actors’ Playhouse, Broadway Musical Theatre, Miami Children’s Theatre, Belen Jesuit Preparatory, The Alliance Theatre (Atlanta), Rising Starz, Evening Star Productions, Slow Burn Theatre, among others. Emmanuel Schvartzman is a two-time Carbonell Award winner. He was part of the original team for the Gloria Estefan Broadway musical “On Your Feet!” (Chicago and Broadway) and Music Director/Supervisor/Arranger for Off-Broadway’s “Real Men: The Musical”. In 2016, he was the Music Director/Conductor for the world premiere of “Carmen La Cubana” at the Théâtre du Châtelet in Paris and was the music director for “Rent” in Havana, Cuba: the first Broadway show there in more than 50 years. Choreography credits for Justine Rosales include "25th Annual...Spelling Bee" (Monomoy Theatre Company), "Anything Goes" (Dance Creations Dance Academy), "Dark of the Moon" and "Baby Case (A New Musical)” (The Hartt School), "The Aristocats Jr." (Roxy Theatre Group) and "Rent" (RK18). Scheck Hillel Community School educates and inspires students 18 months-Grade 12 to become exemplary global citizens with enduring Jewish identity and values through an individualized college preparatory curriculum highlighted by STEM and design, Capstone, college dual enrollment, arts, athletics and community service. Its 14 acres include a state of the art 115,000-sq.-ft athletic complex with additional expansion plans. Set within a nurturing, diverse community, Scheck Hillel is one of the world's largest Jewish community day schools and a National Blue Ribbon School of Excellence. For information, please visit eHillel.org. Jordan Alexander Ressler, z”l, chased his dreams and made them come true. Guided by his passion for life and love for the arts, he launched a successful career in film and theatre after graduating from Cornell University. Credits included original productions of “Billy Crystal’s 700 Sundays” and “Jersey Boys,” both of which moved to Broadway. Sadly, Jordan passed away in a tragic accident in 2004 when he was only 23 years old. In 2007, his family created the Jordan Alexander Ressler Arts Program at Scheck Hillel Community School to seed a legacy of children inspired to discover their own talents, ignite their own passions and chase their own dreams. This year, the school proudly celebrates the endowment’s 10-year anniversary. In what’s proving to be a banner 2015-16 school year, Scheck Hillel Community School made history April 18 when it placed first in the Technion Jewish Day School Challenge, created by RAVSAK and Technion-Israel Institute of Technology. It tied with Bialik College in Australia. The students’ mission was to build a Rube Goldberg machine in the spirit of Pesach and inspired by the intricate 2015 Technion Rube Goldberg machine. A Rube Goldberg machine is a contraption or device that is deliberately over-engineered to perform a simple task in a complicated fashion, generally including a chain reaction. Watch Scheck Hillel's winning entry at eHillel.org. More than 600 students from 41 Jewish day schools in Europe, North America, Australia, and Africa participated in the Challenge. Scheck Hillel students Malvina Dimitri, Zachary Lemmer, Sadie Slomovitz and Hannah Stern, all Grade 6 of the Samuel and Henrietta Scheck Middle School, were led by science teacher Dr. Athena Hadjixenofontos and technology teacher Mr. Charles Mahoney. “In partnership with Technion—Israel Institute of Technology, we were able to create an amazing new opportunity for students to blend their commitments to Jewish learning with the sciences, foster a connection to post-secondary education, and prompt them to apply their knowledge of Pesach traditions in a completely innovative way,” said Dr. Marc N. Kramer, RAVSAK’s Co-Executive Director. Students followed a rigorous rubric, which called for the machines to ultimately reveal a Seder plate. In the weeks leading up to the Challenge deadline, students tinkered away, and got insider tips from world-renowned Technion Mechanical Engineering Professor Alon Wolf and other Technion faculty. The Challenge for these student volunteers was a perfect fit within Scheck Hillel's STEM curriculum. “Our students thoroughly enjoyed putting together their Rube Goldberg machine, simultaneously building the machine itself, connecting with their teammates and enriching their understanding of Pesach,” Dr. Levy said. “The Technion is thrilled to have launched this new initiative together with RAVSAK,” said Technion President Professor Peretz Lavie. “In an ever-changing world we need to find new and relevant ways to connect younger generations of the Jewish people with Israel. What better way to do so than a thought-provoking, fun competition that has a strong STEM education focus? Congratulations to all who participated. I hope to see you all at the Technion – as students – in a few years,” he concluded. From early childhood through Grade 12, Scheck Hillel Community School educates and inspires students to become exemplary global citizens with enduring Jewish identity, values and a commitment to the State of Israel, through a college preparatory curriculum and meaningful co-curricular experiences, guided by Orthodox teachings and set within a nurturing, diverse community. Scheck Hillel is the second-largest Jewish community day school in North America, a National Blue Ribbon School of Excellence and an International Baccalaureate (IB) World School. For information, please visit eHillel.org. About RAVSAK: RAVSAK strengthens and sustains the Jewish life, leadership, and learning of community day schools. With more than 135 member schools, each bringing a unique set of professionals and board members, our network harnesses the collective wisdom of our peers to offer tremendous opportunities for collective learning and action. We provide each school with much-needed material and intellectual resources, dynamic programs for students and administrators alike, and learning opportunities. Visit ravsak.org. About the Technion Faculty of Mechanical Engineering: The bachelor’s degree in mechanical engineering is taught entirely in English in Technion Faculty of Mechanical Engineering. The program provides students with a strong base in the engineering sciences alongside project-based laboratory and design experiences, to develop their independence, creativity and leadership in an era of incredibly rapid technological change. For more information, visit Technion International or email us at apply@int.technion.ac.il. Scheck Hillel Presents Lion King Jr. This family favorite is live on stage for audiences of all ages! Reserve your tickets at eHillel.org/boxoffice today! Scheck Hillel Community School is proud to present this performance through its Jordan Alexander Ressler Arts Program. Arts education at Scheck Hillel is a marker of excellence developed from Early Childhood through Grade 12. Students are given a personal choice for their creative outlet, which helps to develop respect and understanding for all fine and performing art forms. Whether a child’s passion is learning to play the violin or painting a masterpiece, there is a place for everyone in Scheck Hillel’s Jordan Alexander Ressler Arts Program. From early childhood through Grade 12, Scheck Hillel Community School educates and inspires students to become exemplary global citizens with enduring Jewish identity, values and a commitment to the State of Israel, through a college preparatory curriculum and meaningful co-curricular experiences, guided by Orthodox teachings and set within a nurturing, diverse community. Scheck Hillel is the second-largest Jewish community day school in North America, a National Blue Ribbon School of Excellence and an International Baccalaureate® (IB) World School. For information, please visit eHillel.org. When you play in Scheck Hillel Community School's 12th Annual Poker Tournament March 29, you'll be making a difference through the school's Kulanu Scholarship Fund. The evening includes dinner and the game at Mardi Gras Casino; first place prize is $5,000! For details about sponsorship opportunities or to register to play, please visit eHillel.org/Poker. Thank you! WHAT: Scheck Hillel Community School will be hosting schools from across South Florida in the Inaugural Jewish Soccer Classic – a first of its kind for Jewish schools. All eyes will be on varsity boys’ and girls’ soccer teams from Scheck Hillel, Rabbi Alexander Gross Hebrew Academy, David Posnack Jewish Day School, Donna Klein Jewish Academy and Yeshiva High School as they compete in this highly anticipated tournament. The Jewish Soccer Classic will be held at Scheck Hillel’s brand new Athletic Complex, and provides opportunity for community members from participating schools, and beyond, to come together in shared ruach and spirit. We look forward to seeing you there! For more information, please visit eHillel.org/SoccerClassic. Purchase your tickets today at eHillel.org/AnnualEvent. With great excitement and a lot of Lion Pride, the community gathered January 8, for the Ribbon Cutting Ceremony of Scheck Hillel Community School's new state-of-the-art Athletic Complex. To commence the celebration, Scheck Hillel's Head of School, Dr. Ezra Levy officially welcomed families, founders, past chairs, alumni, dignitaries and other friends to the complex and future of the campus. Scheck Hillel was fortunate to have North Miami Beach Mayor George Vallejo, Golden Beach Mayor Glenn Singer, Aventura Mayor Enid Weisman,Indian Creek Councilman Bob Diener, Miami-Dade Commissioner Sally Heyman, North Miami Beach Councilmembers Phyllis Smith, Anthony DeFillipo and Marlen Martell, Israel's Consul General to Florida and Puerto Rico Chaim Shacham and Deputy Consul General Revital Malca join them for the celebration. The City of North Miami Beach even presented Scheck Hillel with a certificate of recognition for this momentous occasion. For 45 years, Scheck Hillel students were without the home-field advantge and have held practices and games at neighboring fields. And yet, the school’s athletics program has soared with regional and district rankings, universities recruiting athletes, international media coverage and one of the nation’s only Jewish varsity football teams. The first phase of its capital campaign, the new 110,000-square-foot Athletic Complex, which houses the Diener Athletic Center, Rok Field and Leo's Court, will enrich the academic experience and open the doors to a lifetime of opportunity for students. Capital campaign leadership co-chairs Susy and Larry Abbo, Michelle and Bob Diener, Marty and Hili Scheck, Tammy and Jorge Woldenberg, and their children, joined Dr. Levy and all the local dignitaries on stage to help him cut the ribbon with giant 3-foot scissors. The co-chairs' remarkable vision, generous heart and commitment to our children made the opening of the Athletic Complex possible. Next up: the 70,000-square-foot Eduplex, which will house classrooms for Grades 6-12, a science wing with laboratories, a media center and new Beit Midrash. From early childhood through Grade 12, Scheck Hillel Community School inspires students to become exemplary global citizens with enduring Jewish identity and values through an innovative curriculum enriched by co-curricular experiences. All of this is set within a nurturing, international community. Scheck Hillel is the second-largest Jewish community day school in the nation, a National Blue Ribbon School of Excellence and an International Baccalaureate World School. For more information, please visit eHillel.org. 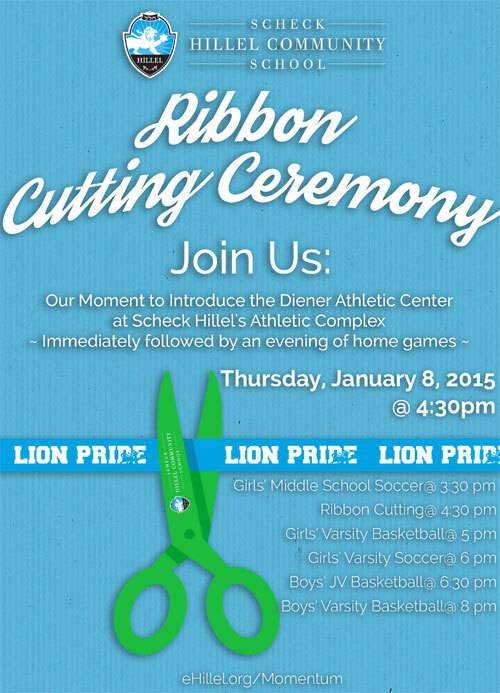 It’s with great excitement and a lot of Lion Pride that Scheck Hillel Community School cordially invites you to attend the ribbon cutting ceremony of the school’s new state-of-the-art Athletic Complex on Thursday, Jan. 8 at 4:30 p.m.
To commence the celebration, Scheck Hillel will host a brief ceremony to officially welcome the community to the new complex and future of the campus. Directly following the celebratory event, the Scheck Hillel Lions will host home junior varsity and varsity basketball and soccer games.